Experience sculptural perfection in your garden with this incredibly easy, low maintenance garden gem. Hummocks of soft green, scented pine needles will add year round interest - we bet you can't resist stroking them as you pass. A particularly slow-growing, spreading shrub, and perfect for growing in containers and the front of borders, eventually producing excuisite, candle-like cones at the ends of its branches. Pinus mugo is happy to grow in ordinary garden soil, so there's no reason not to have a go at growing this fabulous little conifer. Supplied in a 2L pot, your pinus will take more than 50 years to reach its ultimate height and spread of 2.5 - 4m x 4 - 8m. Pinus mugo will create a tranquil haven wherever it is planted, and its hummocks of soft green pine needles simply beg to be stroked, making this very much a touchy-feely kind of plant. No longer just a plant of seventies rock gardens, the Dwarf Mountain Pine is a particularly slow-growing, spreading shrub, and perfect for growing in containers and the front of borders, where its compact, bushy, evergreen habit will give you year-round interest. A favourite for adding to Japanese gardens, this spreading dwarf conifer will stay neat and compact for many years, eventually forming a sculptural mound of spreading branches with candle-like cones at their tips. A garden favourite because it is so easy to care for, basically you can just plant it and leave it and it'll cope with most things that are thrown at it, including exposed coastal situations and urban pollution. Pinus mugo prefers well-drained, slightly sandy conditions and while it grows mostly on limestone in the wild, it will grow in ordinary garden soil too, so there's no reason not to have a go at growing this fabulous dwarf conifer. Supplied in a 2L pot, Pinus will achieving a height and spread of approximately 2.5m x 4m after 20 years. Supplied as an established plant in a 2L pot ready for immediate planting out. 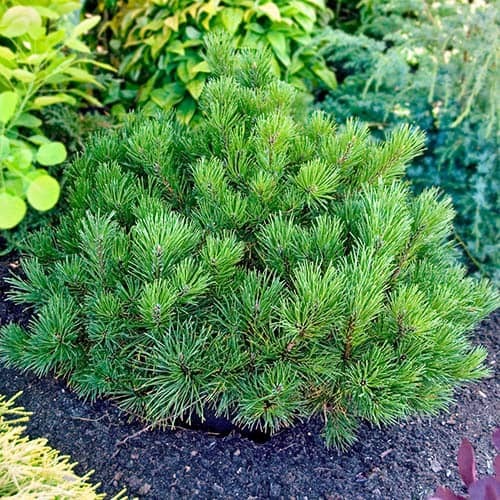 Pinus mugo will naturally grow into a cushion shape without pruning, however can be shaped as a topiary by trimming young shoots before they grow in spring. Grow in full sun in any soil type except boggy soil. Will tolerate exposed and coastal positions. Can be grown in a large container with a good soil-based compost.